1. a shallow recess, especially one in a wall to display a statue or other ornament. When it comes to bathroom remodeling, a niche in the shower or bathtub is one of the most desired requests. These niches can be framed, and finished in most bathrooms, and typically are located on an interior wall cavity. You have a few choices when it comes to selecting a niche that is right for you. 1. You can buy a preformed niche that fits in between your existing framing. This is typically the most budget friendly option. However, there are limitations on the size and location of your niche versus a custom-built niche. 2. Your needs, the space available, and the imagination of your interior designer will determine your custom-built niche. Custom niches can generally be any size, shape, finish and placed in most locations. In most cases the framing on the wall where the niche is going to be located will be removed and re-framed. Once the size, and location of your niche is determined, it is time to select the tile. Your interior designer can be a tremendous asset here. We like to get creative in selecting this tile, in most cases the tile is an accent tile to enhance the wall tile, and cost can range from $25 to $50 a square foot. Usually 5 to 10 square feet of tile will be all you need for your niche. Because there is not much tile needed for the niche, you may elect to spend more on the tile. This way you get a niche unique and custom to your bathroom. As with all remodeling projects you will have a budget and based on that budget you may have to forgo the niche, or make the niche more standard, like the preformed option. The additional demo to remove the framing, then re-framing (labor and material), and the cost to prep and set tile on the niche will have an impact on your budget. But in my opinion well worth the extra cost. 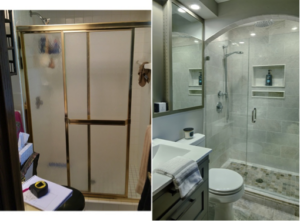 If you are ready for your bathroom remodel to get started, give Excel Builders a call at 612.524.5804. Along with bathroom remodels we also complete kitchen, basement, and whole home remodels, to name a few.